Life is messy. We’ll help you wash up. 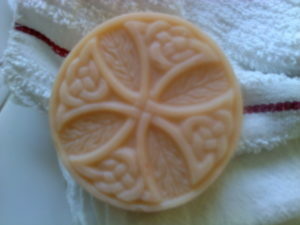 Olive oil-based soaps have been around for centuriesand beloved for their gentleness. We took it up a notch by adding jojoba oil and beeswax, and then lightly scenting it with red clover — a fragrance that reminds us of a springtime meadow after a good rain. Olive oil, distilled water, coconut oil, palm oil, sodium hydroxide, jojoba oil, beeswax, red clover fragrance oil and some shaved red crayon (beeswax and child-safe colorant). On the Beautful shore of the Saint Clair River.